It is a level 20 armor, weight 1. This armor has a gold value of 130000. This armor has a gold value of 760000. It is a level 4 clawing weapon, weight 2. This weapon has a gold value of 4500. Damage is 2 to 16 (average 9). This armor has a gold value of 180000. These four items are all from the Southern Mountain Range and are all made in roughly the same fashion. Follow the guide below to make any of them. First you need to to get the right ore, see the table below. From the square, walk 8w, sw, s, 2sw, s, w, se to get to the room marked "11" on the map. 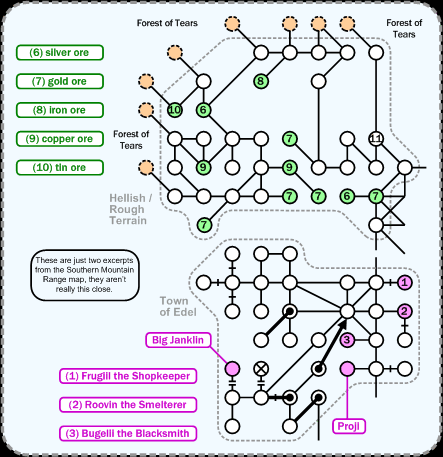 The rooms that have ore in them have hints in the description about 'the glint of metallic rocks' and each of the rooms that cointain ore are marked in green, specifically the group at the top of the map. You have to search for them. Occasionally there are two in one room, but it's so seldom the case that it's not really worth searching after the first one. All the ores are area repop items, and the usual rules apply. Now that you've got the ore, you need to go to Edel to have it smelted. If you can't astral Roovin - and if you can, then do so - then it's probably faster to recall and enter the area from the normal entrance and walk that way ( 6s, ne, 2s, se, 2e, s, 2sw, s, 7sw, 5w ) and walk straight to Edel's gate. Otherwise, the dirs from the room marked as "10" on the map are se, e, 2se, 2ne, n, u, sw, u, w, sw, 2w, sw, 3s, 2se, ne, e, sw, s, sw, s, 2se, ne, n, e, 2se, u, se, 3sw, w, 3s, 7sw . From the gate, Roovin the smelterer is 2s, e and Bugelii the blacksmith is w, s, w from him. Give the ore to Roovin. Don't have him working on more than one of the same type, he'll only give one back - the same goes for Bugelii. He'll say to come back in the morning and to bring a certain amount of money (see the table above). After twenty four mud hours, he'll produce a bar of the ore you gave to him and take the money from you. The shield is the exception - smelt the tin and the copper, then give the bars back to him to be smelted into bronze. Take the smelted ore to Bugelii and over the course of another long boring period of time (a bit longer than Roovin takes), he'll turn it into your item. Once this time has passed, say yes and he'll ask you what it was that he was making for you, reply silver / gold / iron / bronze. He'll give you the item and charge yet more gold.